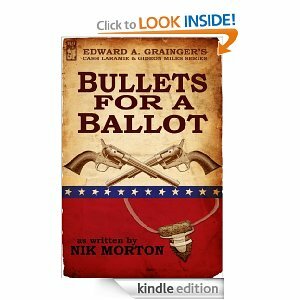 This Cash Laramie outing, by yet another author, is about 119 pages long, and every one of them is full of action, following the twists and turns of what appears to be a straightforward tale of a corrupt mayor running for re-election, using every dastardly trick and opportunity for bribery that his immensely deep wallet makes easy. Oddly enough, the worst corruption comes from someone else. The various authors of this series all seem to have at least one skill in common: they can each portray their characters with a very few words, and still give them distinctive identities. At the same time, both Cash and Gideon remain constant, regardless of who is describing them. In this book, a fresh piece of Cash's history is revealed, together with its consequences, and my only real criticism is that the author does not seem to make any effort to show the impact this would have on the Cash we already know. Anything more would be a spoiler, but see what you think. There's a rather clever literary touch, in that the first and last sentence of the story are the same, but there's a gap of 16 years, and it's not necessarily referring to the same individual, nor true in both cases: read it and judge for yourself. 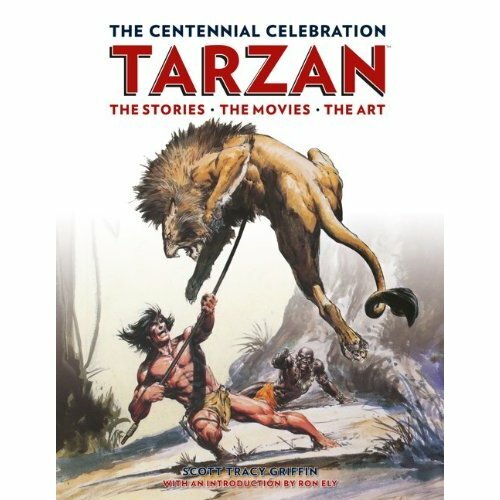 It was just over a hundred years ago, October 1912, that Tarzan first appeared in print and since then he has become one of the most iconic fictional characters ever created. This large and quite weighty tome celebrates Tarzan in text, celluloid and comics, among other media, over that century. Perhaps it’s unnecessary, but I’ll briefly outline his story. John Clayton, Lord Greystoke and his young pregnant wife Alice were abandoned on the east coast of Africa in 1872 when the crew of the Fuwalda mutinied and set them ashore. They were left with two crates of belongings, a rifle and some ammunition. Bravely facing up to the terrors of a strange primitive land, Clayton built a small hut among the trees and there they retired to relative safety, frightened by the jungle noises. Alice gave birth to a boy, John. Nearby, huge apes congregated, issuing terrible grunts and growls: these creatures had their own language and called themselves mangani; they were more hominid than gorilla. Shortly after John’s birth, a great ape, Kerchak, attacked the couple and they barely escaped with their lives. However, a blow to the head permanently affected Alice: while she cared for her baby, she did not step outside the hut again. Some weeks later, she died while the infant slept. At about this time a female great ape, Kala, had lost her own infant, falling to its death from the emerald canopy of the rainforest. Hearing the wailing sound of John Clayton mourning the death of his wife, the apes approached the hut. Kerchak barged in and killed Clayton. But in that same instant Kala snatched up the baby from its makeshift crib, dropped her dead infant in John’s place, and rushed out with baby John clutched to her breast. Acting as John’s mother, Kala called him Whiteskin, ‘Tarzan’ in the mangani language. Little Tarzan survived by chance rather than his prowess, though his young mind quickly outstripped the mental capacity of his fellow apes. A child of nature, Tarzan discovered the world was not an Eden. It was harsh, filled with threat and danger from many sources. When he was about nineteen, he met Jane Porter and they eventually married and had many dangerous and bloody adventures. This book is lavishly illustrated throughout with colourful artwork and stills from the films. It’s a mine of information about the creation of all the books, with a brief storyline of the twenty-four novels. Hollywood never really did the ape-man justice – he wasn’t a monosyllabic tree-swinging hero; in fact, Tarzan became fluent in many languages, among them French, German and Russian. Ron Ely, one of the many screen Tarzans, provides a Foreword in which he rightly states that he believes most of the films and TV productions misplaced the ape-man by putting him into contemporary society when the basic allure is the period he was created, the 1920s, an age when communication and travel were protracted and challenging; though the film Greystoke came close. It’s about time this great character was restored to his former glory, not as an adventurer in children’s fiction but as an exciting pulse-pounding adult hero, which was the original creation. Indeed, the books were considered inappropriate by the Soviet and Nazi regimes as Tarzan represented bold individualism, so the books were banned or burned. Burning didn’t have much effect, of course: over 100 million books by the author, Edgar Rice Burroughs, have been sold, in 37 languages, including Braille and Esperanto. Scott Tracy Griffin, a foremost expert on Edgar Rice Burroughs, has amassed a wealth of information about the ape man and his creator and provides insight into the creation of the novels. This is a book to enjoy and treasure, a slice of cultural history.